VATICAN CITY — With a trip to South Sudan postponed indefinitely, Pope Francis is sending close to a half-million dollars to help two church-run hospitals, a teacher training center and farming projects for families as a way to show the people there his solidarity and support. Because a planned trip with Anglican Archbishop Justin Welby of Canterbury couldn’t happen this year as hoped, Pope Francis “wants to make tangible the presence and closeness of the church with the suffering people through this initiative ‘The Pope for South Sudan,'” Cardinal Peter Turkson told reporters at a Vatican news conference June 21. “He fervently hopes to be able to go there as soon as possible on an official visit to the nation; the church does not shut hope out of such an afflicted area,” said the cardinal, who is prefect of the Vatican Dicastery for Promoting Integral Human Development. An official visit was meant to draw the world’s attention to a silent tragedy, give voice to those suffering, and encourage conflicting parties to make renewed and greater efforts in finding a peaceful solution to the conflict, the cardinal said. Already in March, Pope Francis had expressed doubts about the possibility of making the trip, saying in an interview with Germany’s Die Zeit newspaper, that visiting South Sudan would be “important,” but that “I don’t believe that it is possible.” The pope approved the project funding in April, a month before the Vatican announced the trip’s delay. The initiative is meant to supplement, support and encourage the ongoing work of religious congregations, Catholic organizations and international aid groups on the ground that “generously and tirelessly” help the people and promote peace and development, the cardinal said. South Sudan became independent from Sudan in 2011 after decades of war. But just two years after independence, political tensions erupted into violence and abuses. The fighting, displacement, insecurity and drought have led to large-scale hunger and malnutrition across the country. It’s estimated that 3.8 million people have been displaced and at least 28 million are in need of food aid. A papal donation of about $200,000 will support a program run by Caritas South Sudan, providing fast-growing seeds and farming tools for 2,500 families in areas where it is still possible to grow food. 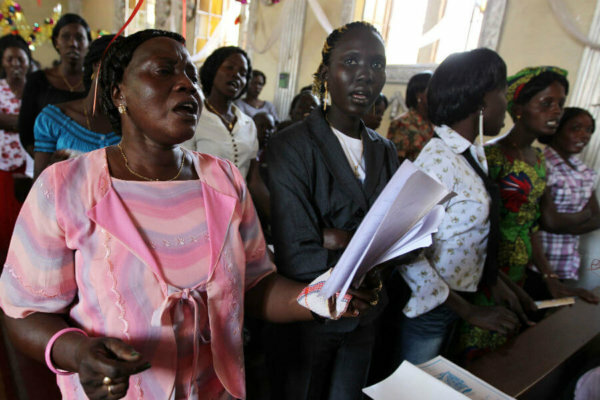 Some $112,000 will go to fund Solidarity With South Sudan — an international Catholic network, supporting 16 scholarships and a training program for primary school teachers. The teacher training center takes in students from every ethnic group so they can learn and later teach values of tolerance and reconciliation along with basic education. A contribution of $150,000 will go to fund two hospitals run by the Comboni Missionary Sisters. Comboni Sister Laura Gemignani told reporters that they have extremely few resources to support their small staff and numerous patients. For example, she said their hospital in Wau sees 300 patients a day — 40,000 a year — but there is only one doctor, who comes in every day and responds to every emergency. “It’s hard to pay his salary,” she said, but he, the nurses and other staff stay on despite the insecurity and danger. When they were told to evacuate because of intensified fighting, she said the staff said that as long as they had even just one patient to attend to, they would never leave.